Looking to explore a galaxy far, far away? 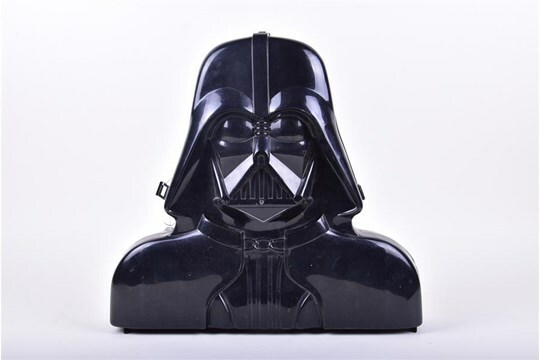 An upcoming auction features original and collectible ‘Star Wars’ goods. It’s common for specialists at auction houses to make site visits, where they might provide a valuation for clients or consign goods for auction. This is true for Dawson’s Auctioneers, which is an auction house based both in London (in Hampstead) and in Berkshire (in Maidenhead). Recently, they placed a visit to a local property in Maidenhead where they had been asked to value some traditional antiques for auction. However, the vendor briefly mentioned that he had worked on some of the costumes for the first Star Wars films and that he had ‘a few toys’ in his garage. 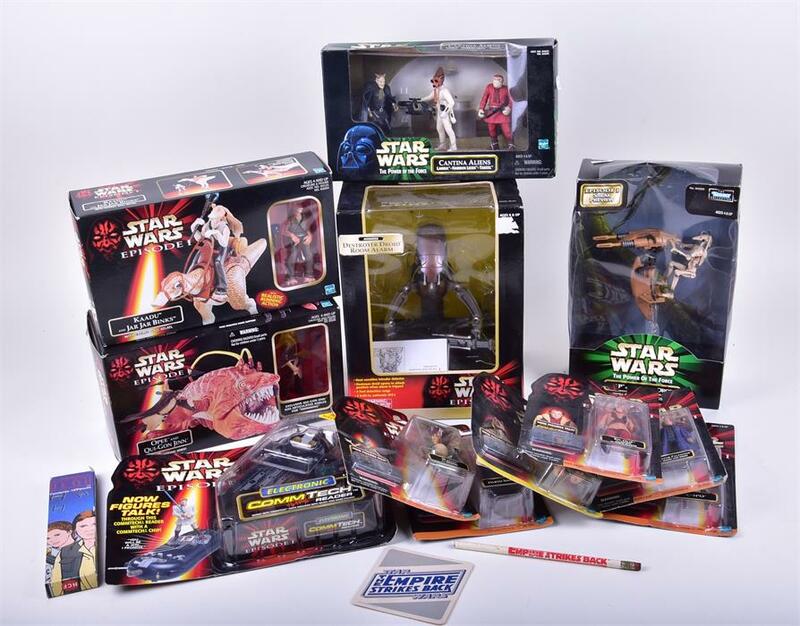 Much to the delight of the valuer from Dawson’s, there turned out to be a large number of Star Wars items – nearly all of them had never been played with and were in their original boxes. And now these items are up for auction. This 1983 Return of the Jedi C-3PO collectors’ case by Kenner contains 39 original Star Wars action figures, some weapons, the original card insert, three sheets of character name stickers (complete and unused), three Kenner 'Collections' booklets and two further Kenner leaflets. These 39 figurines include an exciting trove of characters, from Luke Skywalker (1977) to Darth Vader (1977), Chewbacca (1977), Princess Leia Organa (1977), Ben Obi-Wan (1977), and more. 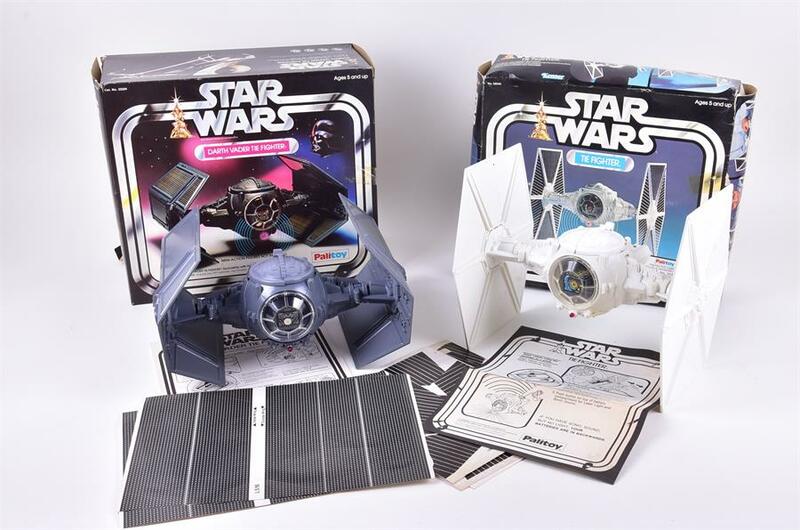 These 1977 Star Wars Tie Fighters, one ‘Darth Vader Tie Fighter’ (in black) and one ‘Tie Fighter’ (in white), are both by Palitoy and come in original boxes with internal packaging, instruction manuals and unused decal sticker sheets. 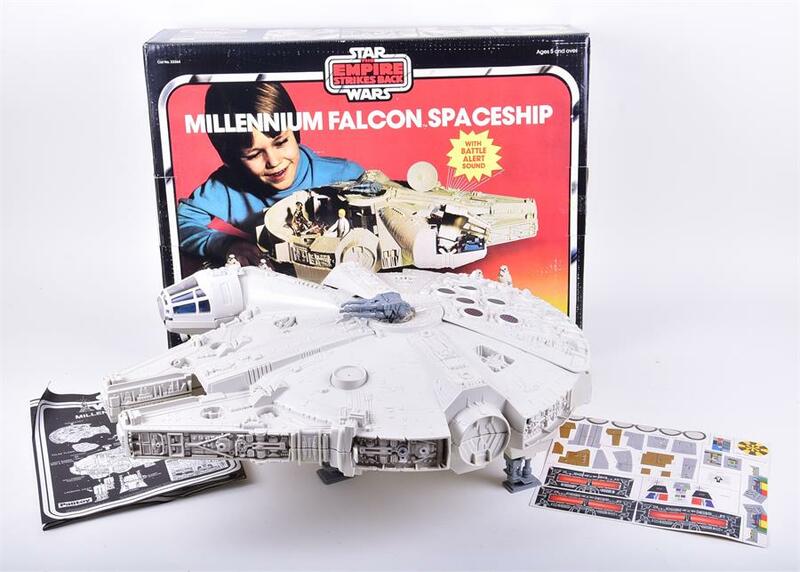 Other flight crafts are also available, including Han Solo and Chewbacca’s spaceship, the Millennium Falcon (by Palitoy), known as the second-fastest vessel in the Star Wars canon. Others available include a 1983 Return of the Jedi Y-Wing Fighter Vehicle (by Palitoy), a 1984 Return of the Jedi B-Wing Fighter (by Kenner), a 1981 Star Wars Empire Strikes Back 'Battle Damaged' X-Wing Fighter (by Palitoy), a 1980 Star Wars Empire Strikes Back AT-AT Vehicle (by Palitoy), a 1983 Star Wars Return of the Jedi Tie Interceptor (by Palitoy), a 1982 Star Wars Return of the Jedi Rebel Transport vehicle (by Palitoy), a 1982 Return of the Jedi Scout Walker Vehicle (by Palitoy), a 1980 Star Wars Empire Strike Back Rebel Armoured Snow Speeder (by Palitoy), and a collection of five c. 1983 Star Wars Return of the Jedi MPC model kits. These Star Wars collectibles are being sold in Dawson’s Auctioneers’ sale of ‘Antiques & Fine Art’, to be held on 27 October. Also included in the sale is furniture, art, jewellery, including a 1999 Rolex GMT Master, maps, books, and other collectibles, including unique entertainment awards given to local comedy superstar Ernie Wise.